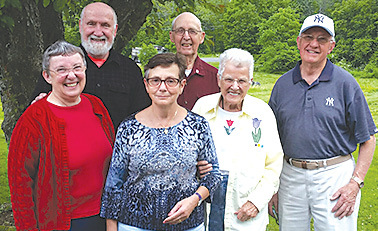 Six of the seven veteran Meals on Wheels volunteers with at least 15 years of service are pictured in the side yard of the Emergency Aid Association headquarters. From the left: Kerry and Bob White, Michelle Holcombe, Dean Caswell, Dorothy DeForge and Peter Kulas. Missing from the picture is Peter Hryniewicz. Meals on Wheels volunteers are the best, hands down. In the past year, over 10,500 meals have been delivered, averaging 29 meals a day to homebound seniors in town. All due to the dedicated folks who gather at Emergency Aid Association (EAA) every weekday, to receive, sort, pack and transport meals to the grateful recipients. EAA Executive Director Janet Frechette says “What is so special – so mind-boggling – is the longevity of those who are actively giving back to their town. These are local heroes stepping up for the community.” Some people have regular routes, on a regular basis. Others sign up as substitutes and pinch-hit for vacations, illness or when a car doesn’t start. As a last resort, staff members will do deliveries, but only about one percent of the time, which speaks to the dedication of the group. Dean Caswell is in his 31st year of delivering meals. Dean says, “I started delivering meals with my wife, Ginny, after I retired. She was one of the original meals delivery people, and continued to volunteer while using a portable oxygen tank. After Ginny passed, I kept on doing it.” What attracted him is he was getting on in years and enjoyed seeing the various ways people were coping with old age. He finds the whole Meals on Wheels process interesting, and “it’s good to feel useful.” As Suffield is the last stop on the route for CRT, Dean learned a long time ago not to count on a delivery time. When the food comes, it’s time to grab the meals and leave. That’s the way it works, one week at a time. Potential volunteers are interviewed by Janet, and then a background check is done. C&S Wholesale Grocers gave EAA a mini-grant to purchase lanyards with an identifier so recipients know the person at their door is “official”. Jo Dzioba, EAA Administrative Assistant, processes the volunteers, and schedules the day-to-day tasks. Jo says the group is selfless and easy to work with. They are willing to be inconvenienced for the good of the whole, sometimes waiting over half an hour for the meals to arrive. The meals have been provided for Suffield residents for over 35 years. Currently, they are made in Hartford by Community Renewal Team (CRT) and are delivered in a heat-controlled truck to Suffield around noon. The volunteers wait and sort by route, then transport the meals in hot and cold coolers. Deliveries are five days a week, but residents can receive seven meals. There are four routes a day, to geographically divide the town, and drivers go out as singles or couples. Janet adds that although the food is important, so is the daily contact. Greeting a recipient at the door turns into a mini well-being check, which is a benefit for out-of-town family members. The reasons that these generous people volunteer their time are many in number. But they all have one thing in common – big hearts and a love for their town.